PROPERTY group Mah Sing Group Bhd said it hopes overseas ventures will be able to bring in 30 per cent of its total revenue within five years. Mah Sing is aiming to launch its first project in China this year and is also working towards participating in property development activities in Vietnam, Singapore and Australia. "China and Vietnam have a high population demand, while for Singapore and Australia, we can offer the type of products they need based on our experience over the years," senior manager corporate communication Lyanna Tew said in Kuala Lumpur. She said the group is expected to do well overseas, given its large network of consultants and architects. Yesterday, Mah Sing held a signing ceremony with 20 of its future tenants at its first retail development project, Southgate Sungai Besi, which will be officially opened in June this year. Southgate is an integrated commercial hub comprising three retail office blocks and corporate blocks with a total new lettable area of 600,000 sq ft. In 2009, it sold a seven-storey Apex Tower in Southgate to Taiwanese Chen Ho-Yuan for RM63.1 million. Among tenants who took part in the signing ceremony include food and beverage outlet Subway, Aunty Anne's and Pappa Roti and fashion house Nichii, which took up 32,000 sq ft of retail shop lot. This year, the property group is projecting between RM2 billion and RM2.5 billion in sales, boosted by project launch, with a gross development value (GDV) of between RM2.5 billion and RM3 billion. Two highly anticipated projects are the MCity in Jalan Ampang and Icon City located in Petaling Jaya. Currently, Mah Sing has 33 ongoing projects with a GDV of RM9.4 billion, which should last it over the next seven years. KUALA LUMPUR: Property developer Mah Sing Group Bhd is targeting to get 30% of its revenue from overseas projects in five years. 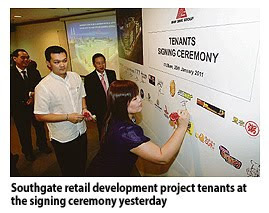 “In five years we hope that 30% from our sales will come from the overseas projects,” its senior manager for corporate communications, Lyanna Tew told reporters after the signing of agreement with the tenants of its Southgate commercial centre project here, yesterday. Tew said the remaining 70% revenue contribution would come from the company’s property projects in the Klang Valley, Penang and Johor. As for the company’s overseas expansion plan, she said it was looking at China, Vietnam, Indonesia, Singapore and Australia. According to Tew, China and Vietnam are good markets due their population and there is simply such a big demand for properties over there. “In other places like Singapore and Australia, we believe that we will be able to provide the type of products that will do well even though their market is pretty mature,” she said. She added that the company also expected to do well overseas because of its network of consultants and partners. PETALING JAYA: Glomac Bhd's proposed acquisition of leasehold land in Puchong from Score Option Sdn Bhd (SOSB) will be advantageous to the property developer for its attractive price and strategic location, analysts said. At RM77mil for 200 acres, the effective cost of the land worked out to be RM8.84 per sq ft, which was significantly lower than the range of transacted or asking prices of RM32 to RM48 psf in Puchong. “The purchase price is deemed cheap,” TA Research said in its report. Located near the established commercial hub of the town with the IOI Mall and Tesco Store in the vicinity, it is basically an extension to Glomac's present development, called the Lakeside Residences in Puchong. “Glomac can now strategise any land enhancement activities to improve the value of its enlarged landbank,” TA Research said. The Lakeside Residences is a joint-venture development between Glomac and SOSB on a 90-acre land to be acquired. The project, comprising 537 units of double-storey terraced houses and 100 units of semi-detached houses, was launched in 2005 with a total gross development value (GDV) of RM250mil. “What's positive is that property prices have increased significantly since the launch of the first phase of Lakeside Residence,” ECM Libra said in its report, comparing the initial launch price of about RM300,000 per unit in 2005 for terraced houses versus the current asking price of about RM440,000. Puchong is one of the property hot spots in the Klang Valley, as the area is easily accessible via Lebuhraya Damansara-Puchong, the Shah Alam Expressway as well as the Bukit Jalil highway. With the land acquisition, Glomac's future earnings capability would be enhanced, as the property developer could now extend its presence in Puchong and gain from the fast-growing property market there, analysts said. “The acquisition would be accretive to the company's net asset value (NAV) and earnings,” AmResearch said in a recent report. On average, some analysts were looking at a potential increase of 25% for the company's NAV and more than 20% in the company's earnings in the financial year ending April 30, 2013. However, Glomac had yet to reveal details such as the GDV and timeline for its “enlarged” Puchong project. Following the proposed land acquisition, Glomac's existing masterplan for the area would likely undergo significant amendment, according to some analysts. Analysts in general viewed Glomac favourably for its strong earnings visibility with unbilled sales of almost RM600mil. They also expect further news flow on land acquisition by the company as part of its aggressive expansion plan. Glomac reported a net profit increase of 71% year-on-year (yoy) to RM15.88mil for the second quarter ended Oct 31, 2010 on revenue of RM140.89mil, which represented an increase of 86% yoy. Over the next 12 months, the company would be launching projects valued in excess of RM1bil. These include a RM250mil apartment project in Mutiara Damansara, a RM145mil retail mall in Glomac Damansara and the RM400mil Glomac Utama mixed development in Petaling Jaya. Hong Kong has the world's least affordable housing, according to an international survey, a finding that is sure to stoke anger among many residents already fed up with runaway property prices. Buying a home in the Asian financial hub, synonymous with its super-rich tycoons and glittering financial district, costs more than 11 times the city's average salary, outpacing London, New York and other major cities, US-based consulting firm Demographia said in a report released Monday. Sydney was ranked the second-least affordable major city, followed by Vancouver, and Melbourne. The 7th Annual International Housing Affordability Survey compared home prices and household income in 325 cities in Australia, Canada, Hong Kong, Ireland, New Zealand, Britain and the United States. It was the first time Hong Kong has been included in the survey.Hong Kong's median home prices in the third quarter of 2010 averaged HK$2.58 million ($330,939), about 11.4 times the median household annual income of HK$225,400. The most affordable homes in the survey were all in the US and Canada, with Saginaw in the US state of Michigan being the most affordable city, where the median house price was $61,400. Atlanta was the most affordable major city, where the median house price was $129,400.Rising property prices have become a major concern for Hong Kong's population of seven million. Worries about a property bubble have prompted Hong Kong's government to announce a series of cooling measures, including boosting land supply and new stamp duties to keep out hot money. Home prices in Hong Kong have risen 50 percent over the past two years, due to low interest rates, a robust economy and an influx of buyers from mainland China, who account for a big portion of purchases, especially for luxury homes. Buggle Lau, chief analyst at Hong Kong property broker Midland Holdings, said he expected home prices to continue to surge in 2011, but he questioned the Demographia survey's methodology. "The survey does not take into account more affordable housing in Hong Kong, like government housing," he said.